Stakeholder Engagement is known to be a process which connects the people who will be affected by a particular decision of organization (Henisz, Dorobantu and Nartey 2014). Along with this the process also incorporates the people who has the capability to influence the particular decision of the organization. The mentioned influence of the stakeholders can be supportive or opposing (Bonsón and Ratkai 2013). The process is significant in terms of practising the corporate social work responsibilities and plays important role in the achievement of the triple bottom line which is a financial structure with the precise participation of the three factors which are social, financial and environmental (Tripathi, Kaushal and Sharma 2013). The process plays an important role in seeking the assessment of the stakeholders regarding the social and environmental issues which will have strong impact in the improvement of the decision making and the accountability (O’Riordan and Fairbrass 2014). The corporate social responsibility is not the main aim in involving the stakeholders rather it is a well-practised method by the renowned organizations in developing an understanding between all the parties related to a particular decision. The method becomes significant in agreement to the solution of the complex issues of the decision and in case of the issues which will pose notable concerns to the organization. The process gets highly effective in cases where the stakeholders have the right to comment on the decisions that will significantly affect the essential environment of their lives (Cundy et al. 2013). The proposal of the runway will observe active participation of the stakeholders which are the government, customers, suppliers, project team, sponsors, airport authority, Labour unions, media agencies, communities (Ruh 2014). The proposal of the new runway will effectively integrate these stakeholders as each of the parties mentioned will be significantly influenced by the proposal of the runway. The paper is to evaluate the perceptions, reactions and knowledge of these mentioned parties regarding the proposal of the new runway. Along with this, the paper will also include a stakeholder engagement plan and assessment of the issues that are expected to be faced and the solution of those issues. The government of the nation will be an important party in the proposal of the runway as the runway will be a significant asset to that particular state. The proposal of the runway will be crucial for the government in case of the taxation. Along with that the government will make sure that the responsible organization for the proposal and implementation of the runways acknowledges and obeys the rules and regulation of the national authority. The aviation policy and regulation of the Australian Government consists of considerable rules and regulations like Aircraft Noise Regulations, Air Navigation Act 1920, Air Navigation Rules 2016, International Airline Licence Guidance Notes, International Air Services Commission Act 1992, Airspace at Federal Airports, Aviation Transport Security Act 2004, Aviation Transport Security Regulations 2005, Air Accidents Act 1963, Civil Aviation Act 1959 and Civil Aviation Regulations 1991 (Infrastructure, Regional Development and Cities, 2018). The government holds precise control over the decisions relating to the infrastructural development of the airports. In this case the proposal of the new runway will be assessed by the government and the implementation will be monitored by the government so that the procedure follows all the safety guidelines along with desired perfection (Wiebusch 2014). The legislation and the legal framework will be a measure prescribed by the government which will guide the decisions of the organization in building the runway (Dixon 2014). The government will monitor the progress of the construction and the monitoring will be on the basis of the truthful reporting. Hence being an important stakeholder in this case, the government will be having strong impact in the progress of the events. The customers are the prime objective of any organization in building or improving the infrastructure. The organizations improve their infrastructure so that the customers get the added advantage and comfort in experiencing the service of the concerned organization (Austrian et al. 2015). The primary objective of these infrastructural developments is to create value among the customers for the organization. The proposal of the new run way will increase the efficiency of the airport in serving increased number customers (Nguyen et al. 2016). The quality of the services is also a major part for the organizations which needs their precise attention as the increment in the quality of the services offered by the organizations will increase the customer satisfaction (Rego, Morgan and Fornell 2013). The frequency of the flights will increase and with that the flexibility of the travelling of the customers will increase significantly. The aviation companies will be able to serve their customers with improved level of infrastructure and that certainly will impress customers. The suppliers are significant part of any infrastructural development as the concerned section is responsible in sourcing the appropriate and quality materials for the concerned operation. The proposal of new runway will be significantly depending on the suppliers as the quality of the materials in building the runway will be a highly influential factor in the success of the plan (Dhakal et al. 2015). The smooth conduction of the sourcing process will enable the organization to execute the plan as soon as possible so that the customers get the chance of availing the improved infrastructure and the added facility of the airport which will be significant for them in transportation. The quality of the materials from the suppliers needs to of the optimum quality as that will ensure increment in the durability of the runway (Stanley 2017). As over the years it is observed that the quality of the materials is one of the major reason behind the imperfection of this sort of infrastructural development and the suppliers’ intention of providing low quality products against a high payment is an influential factor behind the imperfection. Hence the suppliers must provide quality material so that the overall quality and durability of the runway reaches the desired quality. The materials which is to be supplied by the suppliers should satisfy the desired quality standards imposed by the Australian Government and the concerned organization building the runway must form a written suppliers’ code of conduct which the supplier needs to obey at all conditions (SpA 2016). The internal proceedings relating to the construction of the runway is significantly depending on the project team where the team will be the concerned group responsible for the execution of the runway plan. The group will be planning the structure of the runway with precise focus on the runway guidelines where they will be concentrating on the Takeoff Run Available, Takeoff Distance Available, Accelerate Stop Distance Available, Landing Distance Available and Emergency Distance Available (Civil Aviation Safety Authority, 2018). Along with this measurements the project team is also responsible for a close look on the runway thresholds, runway safety area, Blast Pads, overrun areas and displaced thresholds. Apart from this the team will be monitoring the measurements of the threshold, touch down zone and the fixed distance markings (Civil Aviation Safety Authority, 2018). One of the major task for the project team will be the lighting. The aviation industry and the airport authorities are significantly focused in proper monitoring of the lighting section as any sort of imperfection in the mentioned case will be responsible in accidental cases. Hence the project team will be significantly focusing on the proper modelling of the lighting in accordance to the desired and specified technical specifications by the Australian Aviation Industry. The project team is expected to do the lighting with precise focus on the application of the Runway end identifier lights, Runway end lights, Runway edge lights, Runway centreline lighting system, Touch down zone lights, Taxiway centreline lead-off lights, Taxiway centreline lead-on lights, land and hold short lights and approach lighting system (Civil Aviation Safety Authority, 2018). The technical specifications for the application of these lighting systems needs to be closely monitored by the project team. Apart from that the project team also needs to effectively manage the runway safety operations where the team will concentrate on the incidents like Runway excursion, Runway incursion, Runway overrun, Runway confusion and Runway overshoot. Along with that the team needs to monitor the other aspects like pavement surface, surface type codes which are Asphalt, Bitumenous, Bricks, Clay, Composite(COM), Concrete, Composite(COP), Coral, Graded, Grass, Gravel, Ice, Laterite, Macadam, Partially Concrete, Permanent Surface, Marston Matting, Sand, Sommerfeld Tracking and Unknown surfaces (Civil Aviation Safety Authority, 2018). Apart from this the project team is also the responsible for the runway length measurement as well. Hence the role of the project team is significant in this case as their quality service will be significantly needed for the implementation of the plan of the runway. The owners or private investors will be a notable stakeholder in this case. The proposal of the runway will provide the investors with an opportunity to invest their money on a project which has the capability to produce significant return on the investment (Bonsón and Bednárová 2013). The growth rate of the airport with the proposal of the runway, will be increasing as the new runway will enable the airport to serve more number of passengers (Grinnall 2017). This will definitely increase the amount of revenue to be generated. The proposal and the implementation of the new runway will make sure that the customers get the facility of the flexible timing and the opportunity of travelling in increased number of flights (Sokolova 2016). This will be significantly helpful for the customers and will be crucial in creating the customer satisfaction. The repetitive travelling of the customers will be effective in creating an increment in the generation of the revenue. As the investors are able see the scope of having a good business with the proposal of the new runway, the investment will guarantee large return as well (Stanley 2017). The process of investment will be smooth in this case and sufficient amount of money for the implementation of the plan with desired quality will be funded by the investors. The higher rates of return on investment will be the only concern for the external or private investors whereas the internal investors or the owners will be significantly concerned with the customer satisfaction, increased growth rate and increased capability of serving customers (Isaa and Mohamedb 2016). Along with that the owners will also focus on the increment of the profit, durability of the new runway along with the future planning for additional increment of the revenue. The concerned organization for the implementation of the overall plan of the new runway will be the airport authority. The concerned authority is the responsible party in case of the monitoring of the operations of the project team and they are to monitor whether the project team is structuring and implementing the different aspects of the runway development in accordance to the technical specifications described by the Australian Government. The operations of the new runway after the construction is to be executed by the Airport Authority. The concerned section will also be responsible for the air traffic controlling on the new runway along with the aeronautical data transfer, telecommunications, terrestrial navigation aids, flight procedures and emergency services (Isa, Hamid and Leong 2016). The service of the labour unions in the implementation of the plan of the new runway and the post-construction operations will be much-needed. The proposal of the new runway will be significantly producing the opportunity of considerable employment in the nation. This will be significant in improving the socio-economic condition of the nation. The labour unions will be effective in the ground operation of the airport as the implementation of the new runway will bring a rapid increment in the number of customers. The role of the labour union will be effective in the smooth conduction of the implementation plan as the large number of employees will be primarily managed well by the unions. The union will have a significant role to play in solving the possible unrest among the employees regarding the work-time characteristics or the pay scale. The implementation plan of the new runway will incorporate sense of urgency among the employees responsible for the construction as the plan needs to be implemented on an emergency basis (Carnegie and Center 2014). The faster execution of the plan will enable the organization to face limited expenditure for the execution and it will also enable the airport organization to serve the customers even before the estimated date. Hence the work pressure in the implementation of the new runway plan will be significant and the labour union will be in need to manage the situation with effective communication with the concerned organization regarding the over-time compensation or rewards. Apart from this, the labour union will be the responsible authority in making sure that the employees get all the needed compensation in case of any accidents which may take place during the intense operation of the construction. The impact of the plan of the new runway is similar to the customers in case of experiencing the added facility of the new runway. Apart from that the plan will be significantly helpful for the community as well as that will increase the job opportunity (Timmis 2015). The new plan of the runway will be in need of considerable number of employees for the execution and even after the construction of the runway, the usual operation of the airport with a new runway will face the need of recruitment. Hence the smooth conduction of the plan of the new runway will create significant job opportunities for the Australian people. The new runway will also increase the growth of the society as it will help the state to improve their economy. The construction of the new runway is desired to be avoiding any possibility of harming the environment and that will be considered as one of the significant help to the community (Glennon, Cowan and Scanlon 2016). The economic growth of the region is expected to rise significantly with the proposal of the new runway and as the overall growth of the whole community is the integration of the individual growth, the way of living of the people of that region will improve significantly. The media agency will not be a party which is directly connected with the plan of the runway but they are the concerned section of the stakeholder which will promote the plan. The media agency will be instrumental in the operations after the completion of the construction as they will be the responsible group for spreading the news of the improved facility which comes with the new runway (Hubbard and Lopp 2015). The effective promotion of the new runway from different media agency will be instrumental in highlighting the infrastructural development. The government regulatory agencies will be an important stakeholder as they are concerned person for testing the quality and the fitness of the runway. This is much needed because of the fact that the usage of the runway for the transportation needs assurance of the desired fitness of the runway and the government regulatory agency will be able to conduct unbiased testing of that. The role of analysts and researchers will be instrumental in conducting an overall assessment of the quality of the runway and the documentation of business analysis will provide the airport authority proof of the excellence of the runway. High: The legal guideline from the concerned authority is much needed for the purpose. Moderate: the government is moderately affected by the activity as it will increase the growth of the region. Moderate: The engagement between the two parties are moderate. High: The government is a significantly influential group for the activity as it forces the organization, managing the implementation of the plan, to follow the guidelines strictly. High: The impact of the mentioned stakeholder is high. High: the customers are the main contributor to the financial growth of the concerned organization as they will be reason behind the increment of the revenue with the introduction of the runway (Borberg et al. 2013). High: The customers are willing to engage with the activity in a notable manner as it will reduce their efforts in travelling. High: The concerned stakeholder section will be significantly influential for the activity as the new project is mainly directed towards the customers. High: The necessity of involvement will be high as the customers are significantly important for the new run way in order to generate more profit. Moderate: The suppliers are moderately affected with the proposal of the runway as they will be having an increment in the sales of their product. High: The willingness of engaging will be high as both the organization and the suppliers will need each other significantly. The suppliers will be responsible for supplying quality material and in return the organization will be liable to pay the correct amount as compensation. High: The suppliers will be influential as good quality material is much needed for the longer durability of the runway. Moderate: The necessity of the involvement will be moderate as there is larger number of suppliers available in the market. High: The section will be responsible for the implementation of the whole plan of the new runway (Hunter et al. 2017). High: The team will be highly affected with the activity. High: the team is responsible for the execution of the plan and in that case the engagement between the team and the proposal of the new runway will be high. High: the team will be having significant influence on the activity as the success of the plan will significantly depending on the excellence of the team. High: the necessity of the involvement will be high as the team is a much needed party in the implementation of the plan. Moderate: the owners will only be concerned with the generation of the revenue. Moderate: the willingness of engaging to the activity is moderate. High: the concerned section is responsible for the funding of the plan and hence their impact on the success of the plan is notable. Low: the involvement from the concerned section is low. High: the operation of the new runway will be monitored by the authority (Imbert et al. 2014). Moderate: the activity has limited impact on the authority as they will only be responsible for the operation of the runway. Moderate: the authority will engage to the proposal of the runway in a limited fashion as their main concern is the operation of the runway after the completion of the construction. Moderate: the proposal of the new runway and the implementation of the construction plan will merely be affected by the authority. High: the smooth conduction of the construction and the operation on the new runway will be their responsibility. High: the proposal will have immense impact on labour unions as it will provide them the job opportunity. Moderate: the engagement will be moderate as labour union is needed for the smooth management of the employees. High: the concerned section will be responsible in making sure that the employees are satisfied with the operation of the management in case of the compensation or the work time characteristics. Low: the communities’ contribution will be low. High: the activity will have strong impact on the community as it will improve the way of living for the people of that region and will have a significant contribution to the economic growth of that region. High: The willingness of engaging is high as the activity is helpful for the community in creation of the job opportunities for the people of that region. Low: The influence of the community on the project will be limited. Supply of the manpower required for the completion of the task. 1. The absence of sufficient manpower for the execution of the operation will be a point of concern. 2. The absence of proper planning regarding the specifications of the runway will also be major issue in the implementation. 3. The incapability of the employees in managing the tough tasks with limited amount time is a major concern for the organization as the runway is meant to be constructed will significant urgency. 4. The cultural differences among the employees in constructing the runway is also a barrier in the smooth conduction of the implementation. 5. The linking up with the community can also be a significant problem in promoting the new infrastructural development. 6. The lack of the promotional activity for the new runway as a new addition to the airport infrastructure is a significant concern for the organization in the creation of a brand. Standard code of Employment must be there with the employees in order to guarantee an interrupted service of them. The proper balance in the work time characteristics and compensation must be present in order to motivate the employees to work for longer period of time without any sort of dissatisfaction owing to the intense work pressure. The recruitment of efficient employees is much needed for the reduction of the problem of sufficient number of employees in the implementation of the plan. An in depth analysis of the planning must be processed by the project team in order to eliminate any sort of faults related to the planning and specifications for the runway. The cultural training must be given to the employees in order to make sure that the communication and the team working do not get affected due to the cultural differences of the employees. Several promotional activities must be in place in order to promote the new runway as that will effectively attract the attention of the people of Australia. The busy lifestyle and intense pressure of the transportation will be significantly reduced with the implementation of the new runway plan. On a concluding note it can be said that the plan of the new runway included significant amount of engagement between the different stakeholders. The interconnection between the different stakeholders are portrayed with specific focus towards the activities of the concerned stakeholders. From the analysis the necessity of the engagement among the different stakeholders are visible. The stakeholders mapping is pretty clear in stating the importance of the different stakeholders to the project and along with that the timeline of the implementation plan portrays the duration for the expected occurrence of the series of events that relates to the plan. 1. Austrian, E.M., Berry, K.A., Sawyer, M.W. and DeHaas, A., 2015. Planning for the Future: Human Factors in NextGen Air Traffic Management. 2. Bonsón, E. and Bednárová, M., 2013. Corporate LinkedIn practices of Eurozone companies. Online Information Review, 37(6), pp.969-984. 3. Bonsón, E. and Ratkai, M., 2013. A set of metrics to assess stakeholder engagement and social legitimacy on a corporate Facebook page. Online Information Review, 37(5), pp.787-803. 4. Borberg, J., Brandt, S.B., Stein, J.E. and Vann, T., 2013. Knowledge, Capacity, and Needs for Effective Stakeholder Engagement in Marine Planning: Key Findings from a West Coast Assessment. Sea Grant California, Oregon, Washington, University of Southern California. 5. Carnegie, J. and Center, V.T., 2014. 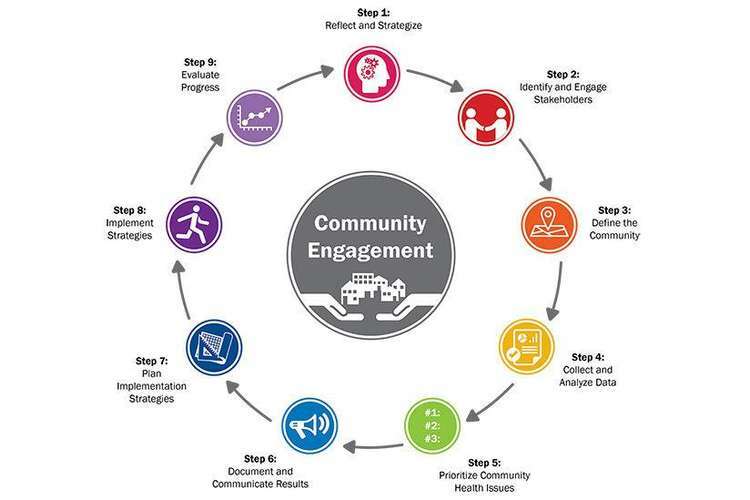 Stakeholder Engagement Report: Transportation. 8. Cundy, A.B., Bardos, R.P., Church, A., Puschenreiter, M., Friesl-Hanl, W., Müller, I., Neu, S., Mench, M., Witters, N. and Vangronsveld, J., 2013. Developing principles of sustainability and stakeholder engagement for “gentle” remediation approaches: The European context. Journal of environmental management, 129, pp.283-291. 9. Dhakal, S.P., Mahmood, M.N., Wiewora, A., Brown, K. and Keast, R., 2015. Stakeholder engagement and asset management: a case study of the Gold Coast airport, Queensland. In Proceedings of the 7th World Congress on Engineering Asset Management (WCEAM 2012) (pp. 195-205). Springer, Cham. 10. Dixon, S., 2014. Managing the Master Planning Process: How do airport managers incorporate stakeholder contribution in their final master plans?. 11. Glennon, M., Cowan, M. and Scanlon, R., 2016, October. 4. Stakeholder engagement for regional geoscientific surveying: the Tellus Border communications campaign. Royal Irish Academy. 12. Grinnall, A., 2017. Airport stakeholder engagement strategy template. 13. Henisz, W.J., Dorobantu, S. and Nartey, L.J., 2014. Spinning gold: The financial returns to stakeholder engagement. Strategic Management Journal, 35(12), pp.1727-1748. 14. Hubbard, S. and Lopp, D., 2015. A Case Study Reflecting Successful Industry Engagement: Utilizing Industry Projects as a Mechanism for Discovery and STEM Education in Aviation Technology. Journal of Education and Human Development, 4(2), pp.175-181. 15. Hunter, G., Holtzman, B., Fernandes, A. and Robinson, C., 2017, September. Advanced Trajectory Modeling: Stakeholder Needs and Expectations. In Proceedings of the Human Factors and Ergonomics Society Annual Meeting (Vol. 61, No. 1, pp. 115-119). Sage CA: Los Angeles, CA: SAGE Publications. 16. Imbert, J.P., Hodgetts, H.M., Parise, R., Vachon, F., Dehais, F. and Tremblay, S., 2014. Attentional costs and failures in air traffic control notifications. Ergonomics, 57(12), pp.1817-1832. 18. Isa, N.A.M., Hamid, N.A. and Leong, T.P., 2016. A Stakeholder Analysis of the klia2 Airport Terminal Project. Environment-Behaviour Proceedings Journal, 1(3), pp.281-289. 19. Isaa, N.A.M. and Mohamedb, W.M.W., 2016. The ‘Love-Hate Relationship’between Airlines and Airports and its Implications to the Aviation Industry: The Stakeholder Theory Perspective. 20. Nguyen, T., Edwards, S., Rahall, N.J., Scott, M. and Cragle, J., 2016. GIS Story Maps: A Tool to Empower and Engage Stakeholders in Planning Sustainable Places. 21. O’Riordan, L. and Fairbrass, J., 2014. Managing CSR stakeholder engagement: A new conceptual framework. Journal of Business Ethics, 125(1), pp.121-145. 22. Rego, L.L., Morgan, N.A. and Fornell, C., 2013. Reexamining the market share–customer satisfaction relationship. Journal of Marketing, 77(5), pp.1-20. 23. Ruh, F., 2014. Munich airport’s third runway and stakeholder communications. Journal of European Management & Public Affairs Studies, 2(1), pp.15-22. 24. Sokolova, E., 2016. Stakeholder engagement: Schiphol airport case: managing engagement with stakeholders when the interests are conflicting (Master's thesis). 25. SpA, A.E., 2016. Code of ethics and conduct. Santiago. 26. Stanley, H.J., 2017. Airport planning and stakeholder engagement: An international comparison (Doctoral dissertation, Queensland University of Technology). 27. Timmis, A.J., 2015. A stakeholder approach to sustainable development in UK aviation (Doctoral dissertation, University of Sheffield). 28. Tripathi, D.K., Kaushal, A. and Sharma, V., 2013. Reality of triple bottom line. Global Journal of Management and Business Studies, 3(2), pp.153-158. 29. Wiebusch, T., 2014. Expanding Frankfurt Airport Under Conflict: Social Responsibility on the Growth Path. Journal of European Management & Public Affairs Studies, 2(1), pp.5-14.